John Knoll, Visual Effects Supervisor of Industrial Light & Magic sums up the book perfectly in the first sentence of his introduction. "The object of this book is to reveal how the environments of Star Wars were created, and to explain why some were done one way and some another." Specifically, there are 365 chapters. They are chapters because one of them talks about the founding of ILM, and the other on the staffing. Both of which I think can't be done in a single day. 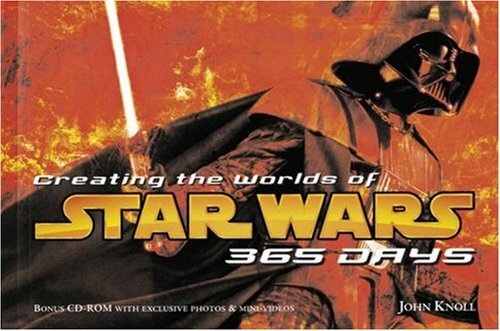 The rest of the chapters are on how they create the sets, props, environment, vehicles and ships. Not just creation, the book also includes how they the props were used to create illusions. For example, Luke's speed was supported by a welded pipe, shot out of frame or blocked by an object like R2D2. To show the speeder movie, a mirror was place underneath it to reflect the ground, creating the illusion that it's floating on air. The book is very thick because each chapter has two pages. The left explains while the right provides the photos, often spilling over. This book is easily a nice photography book without any text. The chapters cover all the six episodes. One can easily see how movie making and technology have evolved since the first Star Wars movie. The book also comes with a CD, containing additional photos and videos on the props creation. This should be another wonderful addition for any Star Wars fans. Special thanks to Kelvin Chan for providing the book for this short review.